Looking for a great piece of art that can also tell you the temperature? 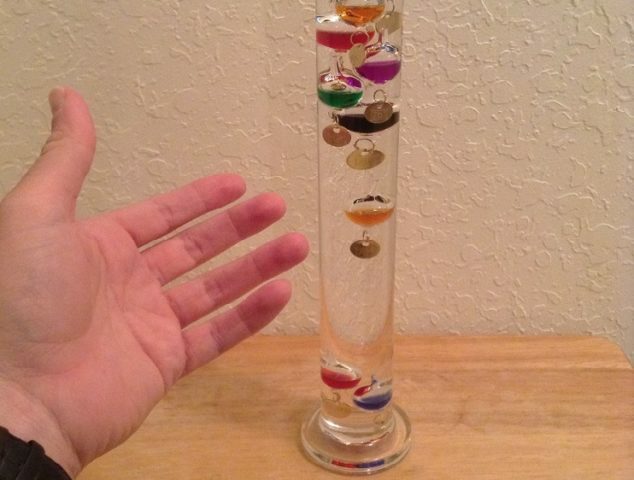 If so, then a Galileo thermometer is exactly what you need. As a weather bug, I was quite excited to receive a Galilean thermometer as a Christmas gift. While Galileo thermometers measure indoor temperatures, they also make a fantastic complement to an indoor porthole barometer and/or a home weather station receiver. It’s sort of a lava lamp for weather geeks like me, I’d even say! I love the Galilean thermometer because it’s a very unique marriage of art and science. You see, Galileo thermometers combine the beauty of the glass work and the principle that the density of liquids changes relative to its temperature. A Galilean thermometer is a type of thermometer that is made from a sealed, transparent glass cylinder and contains clear fluid that contains several small glass vessels filled with liquids of different densities. These little vessels will rise to the top of the cylinder or sink closer to the bottom based on temperature changes and the various fluid densities inside the glass floats. Fun Fact: Galileo Galilei did not invent the Galilean thermometer. He did, however, in the early 1600s discover the scientific principles at play with the namesake thermometer. He also invented the thermoscope, which operates based on the same principles that make a Galileo thermometer work. As you have probably figured out by now, a Galilean thermometer is not intended to provide exact readings of the temperature, though it does a very good job of giving you a general idea of the temperature. Those that tell the temperature based on a vessel floating around the middle of the cylinder. This is how mine works. You can see from the photo on the right that my thermometer is saying it’s 70 degrees in my house – do you see the yellow vessel with the ‘70’ tag floating in the middle of the cylinder? Those that provide a general temperature reading that can be deciphered from the average of 2 vessels floating toward the top and bottom of the glass tube. These Galileo thermometers leave a wide gap in the middle of the cylinder between the upper and lower floaters, in which case there will be no vessels whatsoever. The temperature is determined by the average of 2 vessels that are furthest from each other. To further explain how the second type of Galilean thermometer works, consider a situation in which a vessel that is tagged ‘70’ represents the highest of the lower floaters and the little bulb marked ‘72’ is trailing near the bottom of the group of floaters hanging out near the top of the cylinder. In that case, the temperature is the average of ‘70’ and ’72.’ In other words, it is around 71 degrees Fahrenheit. Like Meteorology? Become An Amateur Meteorologist!